Every week on The Treatment, host Elvis Mitchell conducts in-depth interviews with the most innovative and influential people working in entertainment, art, and pop culture. He speaks with an amazing array of guests, discussing everything from their inner conflicts to their interior design. With a straightforward style that understates his vast knowledge, Elvis is able to extract insights, issues and inspirations from even the most introverted guests. 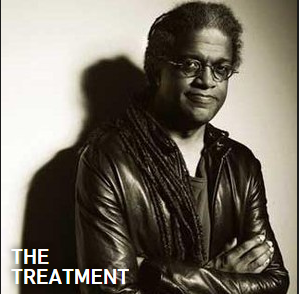 Elvis Mitchell has hosted The Treatment, with its inside look at the creators of popular culture, since KCRW first aired the program in April of 1996. Mitchell served as the film critic at the New York Times from January 2000 until May of 2005. In October 2002, he gave the prestigious Alain Locke lectures on African American culture at Harvard University, and subsequently, has been a visiting lecturer at Harvard in Visual and Environmental Studies, and in African American Studies. He has been editor-at-large at Spin magazine and is special correspondent for Interview magazine. Elvis Mitchell has been entertainment critic for NPR's Weekend Edition with Scott Simon since the show's inception in 1985.